On the other hand, this particular heaven is also exhausting. I’ve been running at full power 24/7 since Monday. Thankfully, I’ve had Shane and the rest of our conference team to keep me at least running in the right directions. Nevertheless, I need some time to assimilate all this new data before I give you my conference wrap-up. We’ll do that next week, although I will give you a few first impressions at the end of this letter, which will be the shortest I have done in many years. Today, I’m going to recap one of this year’s new speakers, Karen Harris from the Macro Trends Group at Bain & Company. She has done some ground-breaking research on job automation and the future of work. Much like geopolitics, these factors define the parameters in which other trends develop, so I made Karen one of our day 1 lead-off speakers. As you’ll see below, her presentation was even more enlightening than I expected. First, a quick reminder that you can still get your SIC Virtual Pass to access both audio and video recordings of Karen Harris and every other SIC speaker. For most speakers, it also includes a PDF copy of their slides. All told, it’s more than 20 hours of outstanding speakers and incisive analysis you can’t find elsewhere. We even throw in written transcripts. Click here to learn more and order yours now. Get instant access to these insights and hundreds more for a $400 discount now! 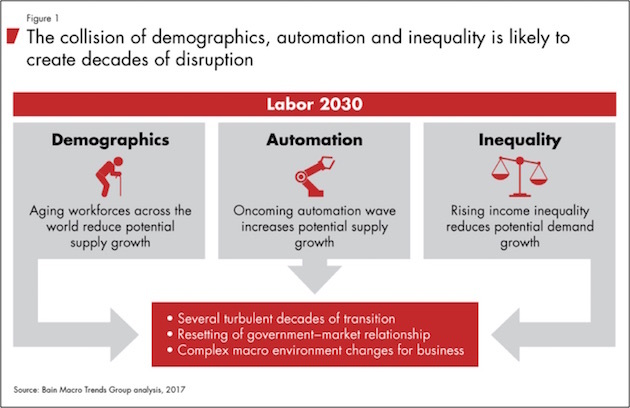 Last month Karen’s group issued a magnum opus report called “Labor 2030: The Collision of Demographics, Automation and Inequality.” I’ve written on all three of those subjects, but Karen teases out the connections among them in ways I’ve not seen elsewhere. 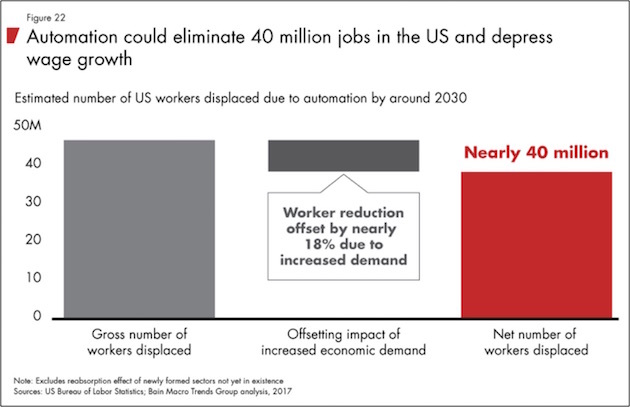 First, the bad news: Bain thinks automation will eliminate up to 25% of US jobs by 2030, with the lower-wage tiers getting hit the hardest and soonest. That will be devastating, and it’s not that far away. Remember 2006? Right now, you are halfway between then and 2030. Time flies, and this time it won’t be fun. 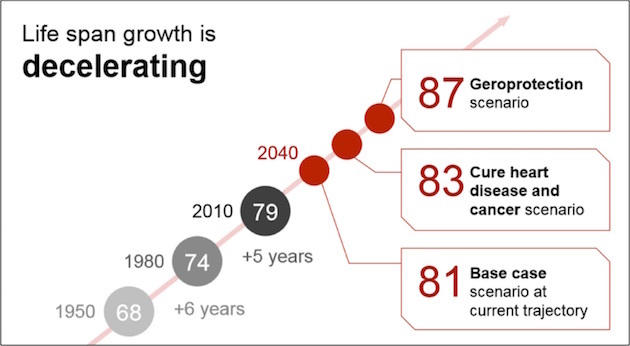 Interestingly, though, Bain predicts that the manpower needed to build out the technology that will ultimately eliminate all those jobs will be enough to keep us all working until 2030. The Bain team is a tad more optimistic than I am. But they have their reasons. Why is this happening? Demographics and automation are mutually reinforcing trends. One we already see: Employers turn to automation increasingly because they can’t find workers with the skills they need in sufficient numbers. The Baby Boom generation is leaving the workforce (though many Boomers are delaying retirement as long as they can). The additional labor that came from one-time factors like China’s opening has mostly run its course. If sufficient numbers of qualified people aren’t available, employer turn to machines. At the same time, technology is making the machines better and less expensive. Much of the job automation so far has been fairly benign, jobs-wise. It has replaced dangerous factory work or other repetitive, unpleasant manual labor. 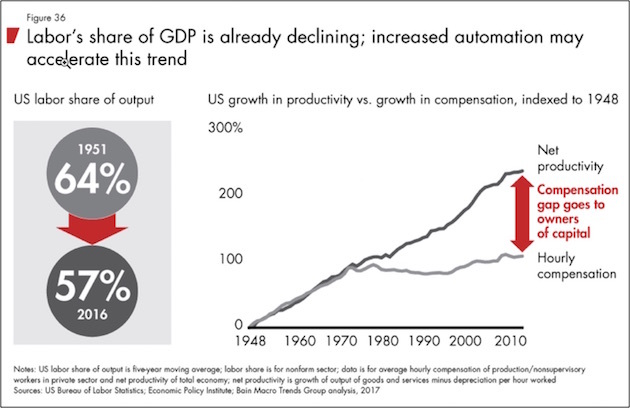 Often the automation makes human workers more productive instead of replacing them. That’s about to change as artificial intelligence technology improves. Machines will be able to perform cognitive tasks that once required highly trained, experienced humans. Now, at any given company this trend can look like a good thing to the owners. Invest in machines, lay off people, mint more profits. But that’s short-sighted in the aggregate because someone has to buy your products. The workers your company and others just laid off won’t be able to spend as much unless new jobs replace the ones you just eliminated. In theory, automation will enable lower prices, which will raise demand and create more jobs. Bain does not think it will happen that way. They foresee up to 40 million permanent job losses in the US, even accounting for higher demand. In other words, in the next 10–12 years the US economy will swing from a labor shortage to a huge labor surplus. With the labor force presently around 160 million, this implies an unemployment rate around 25%. I find it hard to see how we could call that an economic boom. But let’s be optimistic and assume other jobs do appear for many displaced workers. The situation still won’t be ideal for either them or the economy at large, because they will likely make less money and have less spending power. Karen’s report points out that wages will face downward pressure long before workers get replaced by machines. The mere existence of the new technologies will cap wages as the price of automating vs. employing humans falls. The result will be even more inequality between lower-wage workers, highly skilled professionals, and business owners. That will create a variety of problems, one of which is consumption growth. The small number of wealthy people at the top can only spend so much. They save most of their income. Lower-income people spend more of their income. This pattern will only intensify. As you might imagine, this doesn’t end well. The best case is that reduced consumer demand caps growth and we’ll see more decades of flat or mild growth. The worst? Economic dislocation and inequality lead to social breakdown and more calls for government intervention, higher taxes on the wealthy, and more generous welfare programs. None of those outcomes would be good, but it’s not clear to me how we’ll avoid them. Note also that these projections aren’t coming from some liberal think tank. Bain is as business-friendly as it gets. It employs talented people like Karen Harris to examine factual evidence and make accurate projections, so its clients can plan for the future. I invited her to SIC because these are facts we can’t ignore. We have to face them. Following Karen’s SIC presentation, I had her on stage with me and biotechnology expert Patrick Cox. He and I both follow the ongoing research aimed at extending both lifespans and “health spans.” We want to live longer and healthier, and we see many breakthroughs coming. These advances will have economic effects as well. At SIC Patrick quoted no less than Alan Greenspan saying that our debt and other problems are really healthcare problems. Improved health spans are among the solutions we need. Karen is somewhat less optimistic on this issue. Her research shows lifespans increasing but not as quickly as Patrick and I hope to see. Here’s a chart from her presentation. Being a consultant, of course, Karen zeroes in on the practical impact of these forecasts. One important point is demographic. Whatever degree of life extension we achieve, results won’t reach every population group at the same time. This inequity will result in distortions that could get uncomfortable, or worse. For instance, enabling older people to work longer could accelerate automation-driven job losses. Younger generations will feel the impact of this trend disproportionately, and many won’t like it – which brings us to possibly the darkest part of Karen’s forecast. As we see large parts of jobs destroyed, displaced workers won’t meekly surrender, nor will they be happy that small numbers of highly talented, mostly older workers receive most of the rewards. They will want help, and in a democracy they will have the power to demand it. This response means that the populist movements springing up all over the world will probably keep gaining momentum and, increasingly, taking control of governments. Resulting policy changes could be significant. Karen pointed out that mild measures like job retraining probably won’t suffice this time. We could see major expansion and redesign of the “safety net” programs. On Thursday evening, we did in over-the-top, in-your-face, no-holds-barred conversation with Democratic pollster Pat Caddell, Neil Howe, and Steve Moore of the Heritage Foundation. When I told the audience it was time to close the session, the audience booed. They clearly wanted more. Not wanting to get taken out back and strung up, I extended the session; and over 90% stayed for another 30 minutes. Frankly, the panel participants themselves wanted to extend the session. How to pay for all this? Karen expects pressure for a wealth tax. Not an income tax, mind you, but a tax on all your wealth. That will be aggravating to many who have already paid tax once when they earned that wealth. Now imagine having to “donate” 1% or 2% of your net worth to the IRS every year. It could happen, and if it does, it will make it that much harder to keep your assets growing against other headwinds. I agree that we want see a wealth tax under a Republican-controlled Congress and White House, but these things do not last forever. When a populist backlash takes us to a different state of mind, when a Bernie Sanders/Elizabeth Warren type figure emerges, likely much younger and more charismatic than his or her predecessors, with the siren song of how the rich should be made to pay to make society more “just” and equal, because they benefited the most and the majority of the population did not, that message will resonate. I know what our premarket/libertarian rhetoric would say. Many of us would suggest that this outcome would be a terrible thing for the country. But it is quite possible that many more voters in this country will disagree with us, and things will change. Remember that significant majority of millennials, who will be voting in greater numbers, think that socialism is superior to free-market capitalism. Okay, back from my rant… For investors, a wealth tax would mean that merely keeping your wealth, much less growing it, may get a lot harder in the next decade. As noted above, I came home to find my Internet was down, so I could not get the letter out immediately. Clearly the problem has been solved now, and so this letter is going out late on a Sunday. And I am making an executive decision to not have it edited which means there will be more mistakes than usual. I had more than one conference attendee tell me that it was going to take several weeks to absorb the massive amount of information that was thrown at them. A significant portion of the attendees elected to purchase their own Virtual Passes so they could do a mental rewind here and there. Plus they get the transcripts and the PowerPoints. Some will want to watch the videos and others simply to listen while they are doing their cardio or driving. I know that I will be reviewing at least half the sessions and all of the PowerPoints, which will likely make me go back and review the actual sessions. I had many attendees come up to me late in the conference, telling me this was the best conference ever. Some of them have been coming for 10 years. Every year I walk away wondering how we will make it better, and that becomes my challenge for the next year. 1. The majority of the speakers do not expect a recession this year but do not rule one out, either, or else they expect a recession in 2019 and at the latest 2020. There were some very aggressive exceptions that think we well move on well past 2020 because they see the tax cuts as monstrously stimulative. 2. There were not many full-throated bulls on the podium. The consensus seems to be that we are close to the end of the cycle, but there were significant differences over how that would play out. 3. George Gilder told us, as he has for a long time, that information is always a surprise. My interview with him was worth the price of admission. I have never seen him that animated and on his game. And we will talk about it in future letters, but I don’t think I can convey the enormity of the multiple surprises that many of us experienced at this conference. John Burbank, macro hedge fund manager extraordinaire, is totally changing his business model and style. The point he made was that when you are at the beginning of a new “regime” or era, you have to focus all your attention on understanding what is happening and ignore everything else. There were other very successful managers/businessmen who are walking away from apparently successful business models to adapt to what they see is a new and compelling paradigm. They gave me a lot to think about. Am I in danger of being left behind? Here I am writing about what the world will look like in 20 years, and I could find myself redundant and a has-been if I miss the train that is pulling away from the station. But in the meantime, it is time to hit the send button. Over the next few weeks I’ll do a recap of the conference, but I along with all of the attendees would suggest that you get a Virtual Pass and watch/listen for yourself. You can get your Virtual Pass by clicking on this link. Have a great week. I am going to spend the rest of the day – and maybe a few more days – reading science fiction and gathering my thoughts. March 11, 2018, 5:52 p.m. While my wife and I enjoyed Karen’s energized presentation, there is hard data to the contrary. The introduction of ATMs 20 years ago was thought to be the end of bank tellers. As of this year, there are more tellers than 20 years ago. Something to think about.